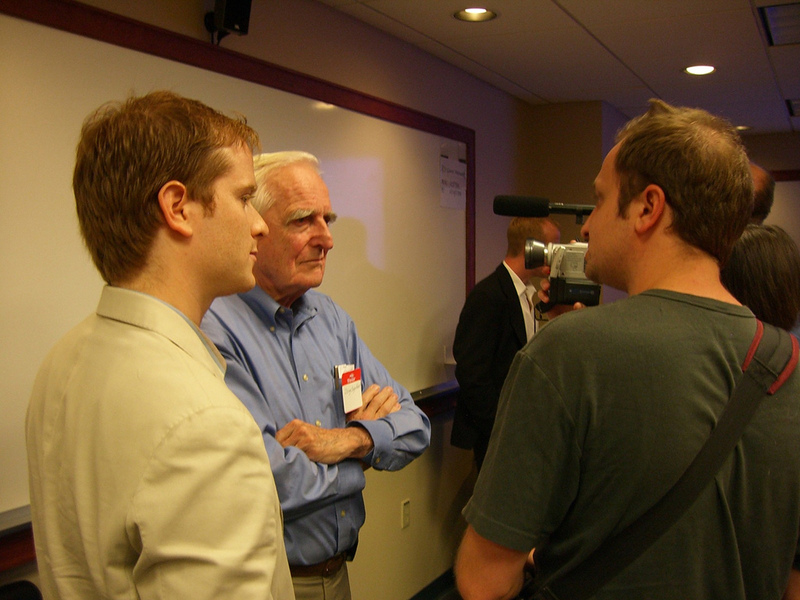 Douglas Engelbart passed away last night. He was a great man and a warm soul. I got a chance to work with Doug and his daughter Christina, along with Eugene Kim and Jonathan Cheyer. We had an NSF funded project in 2006 to re-build parts of his original system (and the original hypertext system) to work on the web with the HyperScope project. Unfortunately HyperScope used some hooks that aren't around anymore so doesn't work on the latest browsers. It was a tremendous honor to get to work with Doug. He was a great role model on how to be an innovator while remaining a great person. I liked to call him the respectful revolutionary; he would hold opinions that were very divergent than those around him, what he liked to call being able to tolerate high levels of embarrassment, while remaining a great person to be around. He always had a twinkle in his eye. One of Doug's gifts was to always seek out what he called the "leverage" point. The leverage point is that single thing, that if you solve, will ripple through a system and change everything else. Doug felt that seeking to innovate and transform leverage points would give you a bigger payoff then just focusing on the small fry. This is why he was so focused on transforming our ability to communicate and act more intelligently: he saw intelligence and collaboration as the leverage point behind so many of our other problems. If we could transform those, he reasoned, perhaps it would ripple through and change other things? Just as Nicola Tesla 'felt' electricity in his bones and knew it intuitively, Douglas Engelbart 'got' the idea of bootstrapping and co-evolution on a deep level. In co-evolution, we and our tools (and our methodologies of working with our tools) all co-evolve in a rapid manner. Having new tools opens new possibilities, while training and education unlocks new possibilities for our tools. Engelbart looked at this in a systems way, wondering about what might be possible if we didn't just innovate in terms of our tools but if we innovated in terms of our education and 'softer' technologies like our methodologies and ways of approaching things. He reasoned that we might be able to bootstrap ourselves even further by focusing on all parts of what he called the 'human system', not just our hard and fast tools. Brilliant stuff. Engelbart had so many great, different ideas like this. Another was the belief in human potential; he never felt that computers would replace us, as the AI camp thought. Instead, he argued that computers would _augment_ us, acting in concert (again, bootstrapping and co-evolution) to make us even more powerful then what we could do without them. This is where he got so many of his ideas from: the computer would act in much more real time then what was available in the past (punchcards vs. video monitors, mice and chord keysets vs. punchcards again), augmenting and lifting up human potential. The last fifteen years or so Doug was focused on an even more intriguing leverage point then human thought; he wondered if it was possible to accelerate the tools that themselves cause innovation. In effect, he was trying to find the second order derivative of innovation -- instead of just trying to come up with faster innovations, is it possible to accelerate the tools we have that enable us to have innovations themselves? In essence, he imagined organizations with three parts: there would be a group that would do R&D and try to come up with new ideas, group A. Then there would be another group that helped group A come up with ideas faster, called group B. Then, there would another group, group C, that would help group B come up with even faster ways to help group A innovate! Heady stuff, infinitely looping like a snake eating its own tail. Another idea of Doug's was homesteading the future. You could create small bubble groups that would bootstrap and innovate quickly to create the future, eating their own dogfood and co-evolving along with the tools they created as a group. He felt that this would be a fast way to zoom into the future; its basically what we've been doing at Inkling with our Habitat publishing tool, using the tool ourselves to redefine publishing while being changed by the tool itself to unlock new directions to go in. It's a powerful process. Engelbart could be a bit abstract sometimes, which could make his ideas a bit hard to grasp; the ideas themselves also sometimes had an intellectual slipperiness that might cause them to not hold up as well if you zoomed too far into them. I also think the computer industry has made great strides and created many new fundamental ideas, and become a much more democratic medium due to personal computers and the Internet; I think Engelbart was angry at the direction the industry went, while I think many great things have happened since his work. In addition, Doug's bootstrapping and homesteading the future approach can sometimes create bubbles that are so far outside where society is now that it can be difficult to backport them to the future (see: Xerox PARC and the original SRI Augment/NLS itself). I also believe that expert-oriented systems and ease-of-use can co-exist and solve different problems, while Doug was angry at the development of user-friendly approaches to computer systems. With all of this said, Doug was a tremendous visionary and a great human being. He showed you can do great things in the computer industry while remaining a good person. I'll always be grateful and humbled that I got a chance to connect with him on a personal level and learn from him. Rest in Peace, Doug! I just know you're giving the Mother of All Demos in Heaven right now. Thanks for the insight, Brad. In 2006 you took me aside, talking very excitedly about your work with Doug and demonstrated your browser implementation of Hyperscope with a giant mouse and a chord-based keyboard. It was fascinating and enlightening. I am glad to see you making it clear that his work and ideas far exceeded the manifestations of his vision that we have come to know.